I thought this would be a great DIY to share close to Mother's Day! For a while now, Audrey has been pulling at everything while she nurses. My hair, her hair, my bra straps, you name it! If she can reach it, it's fair game! One day, when I was looking up something completely unrelated on Kellymom, I stumbled across the topic of nursing necklaces. I'd honestly never heard of them before, but it sounded like such a great idea! The concept of a nursing necklace is simple... it's just something safe for baby to grab while they nurse. I found these, which I really liked, and I thought it would be pretty easy to make my own. 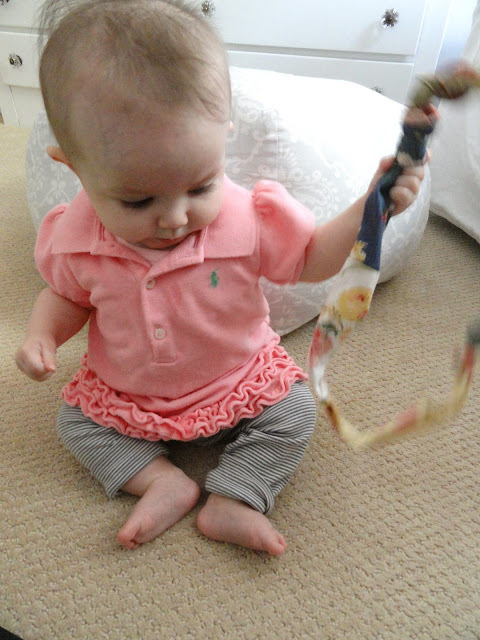 The great thing about them is that they double as a teething necklace as well! For this necklace, I combined different swatches of fabric that I had on hand. They were actually swatches I cut out from a Ralph Lauren fabric book years ago. You can certainly make it easier on yourself and just use one strip of fabric! First, cut your fabric to about 5" wide, and 58" long. Once I had all my swatches cut to 5" wide, I just lined them up, pinned them, and sewed them together. If you're using one piece of fabric, you will obviously skip this step! Next, fold your fabric strip right-sides together, pin and sew. Flip the fabric so it's right-side out. Now you have a tube of fabric. About 10" from the end of your fabric tube, make a knot. Drop a wooden bead down the other end of the tube, and make another knot after the bead. Continue adding beads and knots. I used 7 beads, but you can use as many or as little as you like. Once you're done adding beads, cut some fabric off of each end to get your desired length, and to make the necklace even. Fold the ends of the fabric toward the inside of the necklace, and sew them together. You could even use pretty ribbon as the string of your necklace, but I didn't want to have to mess with tying ribbon to put it on. Here's another one I made with just one strip of fabric. Audrey tested it out! I think she was excited! I wear these necklaces constantly, and they've really helped! 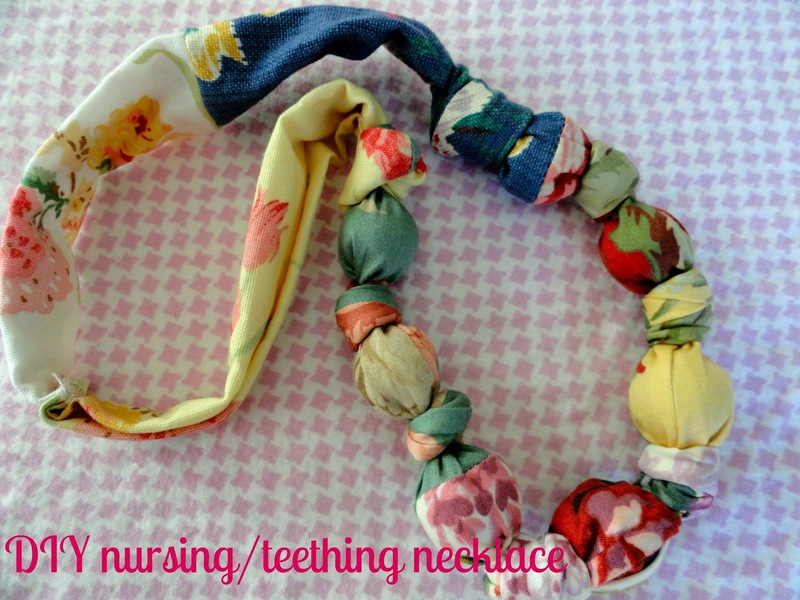 Plus, I think they're kind of cute anyway, even if you don't have a nursing or teething baby! AWw! She's a cutie! And definitely excited about her new teething ring. lol. What a cool idea- and way cuter! My Grandson loves to chew on everything, so this is a great idea for a teething "ring" for him! Off to buy some wooden beads. I love Audrey's face in the first picture!!! LOL. Super cute photos of her all excited! Too easy to make! I'm going to make one for me and my sister-in-law - today! 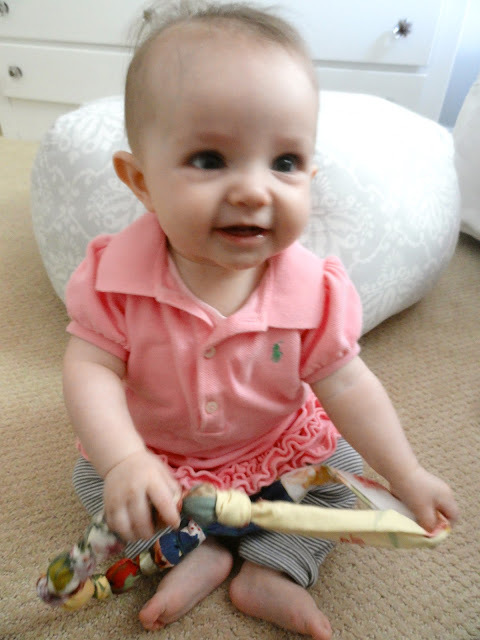 I use old ties...of my dad's and grandpa so they really have special meaning!!! Thanks for the idea, I just need some wooden beads now. In desperate need of one of these. Sounds so easy that I'm going to give it a try. Thankyou! Maria, you can just toss them in the wash with other clothing....if you have a mesh bag I'd throw the necklace in there first, just to give it a little more protection in the washer, and to help it not to get tangled up with other clothes. You could air dry it or toss it in the dryer for a short amount of time. Hi I was looking at your adorable pattern and wanted to check the length of the fabric pieces. Yes, it's 58" long total! Hope that's helpful! Hello. What size beads did you use? I used a couple different sizes - smaller towards the ends and largest in the middle...but you can use any size you want. I'm not sure exactly how big mine were. Hey there! Stumbled upon this as I am wanting to make a necklace for my teething and nursing 5 month old!! How did you do the ends? I don't get it.....not a very crafty person although I try! Help! Hi Sarah! Sorry for the delay in getting back to you...I just overlapped the unfinished ends and sewed a straight line to join them together. You could make them look more finished by tucking one end into the other, and folding the raw edge inside the tube. Hope that helps! Sorry the tutorial wasn't very clear for that step! Is there any way you can make me one if I pay you through paypal? I recently had surgery for carpel tunnel and my right hand is completely useless. I love the one you made with different fabrics and I've looked on etsy and ebay and they just aren't that cute. Please let me know. For some reason its not letting me load my account name on here so you can email me directly at meganthrasher82@gmail.com thanks mama!!!!! I love this idea. Your necklaces turned out great. can I ask where you found the wooden beads? thank you!